We are a prominent manufacturer and supplier of wide array of Chocolate Products. The offered products are prepared using high quality cocoa and other important ingredients. 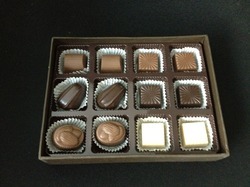 Our chocolates are widely used as gifts and presents on occasions and festivals. All our chocolates are processed using traditional methods and modern techniques with various innovative recipes and concoctions. The offered chocolates are rich and tend to melt in the mouth because of the great combination of nuts, almond rocks, sugar free assorted and chocolates with caramel. These are widely acknowledged for their features such as mouth-watering taste, tempting flavor, rich aroma and high nutritional value. Moreover, the offered chocolates are widely demanded in retail outlets, factory outlets, hotels, corporates and many areas. In addition to these, customers can also avail a wide variety of assorted nuts, assorted plain, nutty rocks, almond rocks, sugar free assorted, chocolates with caramel, mocca, orange, coconut, nut paste fillings & many more premium chocolates from us.